Info "What is this silhouetted object? Spin it around and figure out what it is!" Shady Characters is one of Ashley's Microgames in WarioWare: Smooth Moves. 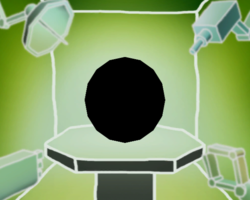 There will be a silhouette of an object, and the player will have some brief time to rotate it around to identify its physical features. Afterwards the player will be asked to identify the correct object with colored pictures by pressing or . 1st level difficulty: Three shapes to choose from. 2nd level difficulty: Three objects to choose from. 3rd level difficulty: Six objects and shapes to choose from. This page was last edited on February 19, 2018, at 22:53.